There are many conditions in the arch of the foot. Podiatrists suggest that a firm diagnosis and treatment plan should be established when symptoms arise. Common conditions such as Plantar fascia pain, over use of the arch, tendonitis and muscle strains can be routinely diagnosed by our podiatry team. Uncommon conditions such as fractures, stress fractures and systemic conditions; for example rheumatoid arthritis, osteo-arthritis ( degenerative change ) and rare conditions such as charcot marie tooth disease may require investigation and a specific management plan to be discussed with you by our podiatry team. 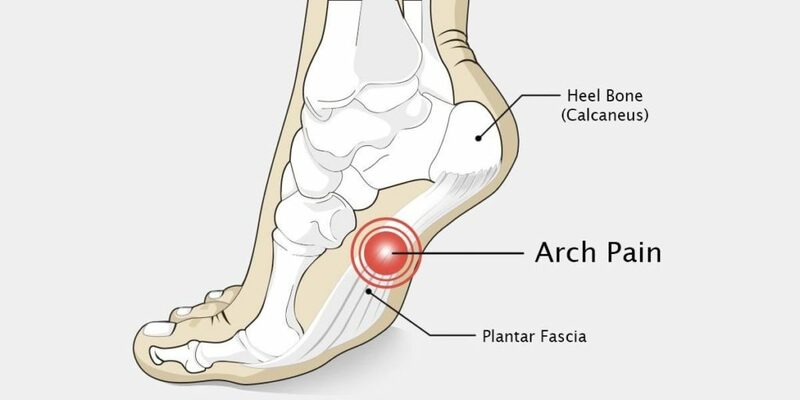 The most common cause of arch pain relates to faulty structure of the foot and over training during sports or exercise. A common cause of arch pain is usually flat feet. People have flat feet for various reasons. Children can have flat feet from a young age. There are two types of congential flat feet; Flexible and None flexible. Children’s flat feet and arches usually self correct through prescribed exercises, orthotics or simply monitoring. It is important to seek a podiatry opinion on whether children’s feet are flexible or none flexible. This would then identify whether your child requires treatment or monitoring. In adulthood there are also many causes of arch pain and flat feet. A list of potential causes are listed here: Adult acquired flat foot (PTTD), sports, arthritis, after injury, long term bunion, after fracture, footwear, post pregnancy, age, weight, medical history and many more! Wearing supportive footwear can help arch pain such as trainers, however it is always sensible to seek medical attention. Pain in the arch of the foot during the day on walking or in the morning. We are here to help diagnose your issue and recommend a treatment programme to suit your condition. How can our team help if you have arch pain ? A Gait analysis / Biomechanical examination may be booked following an initial consultation to identify the cause of mechanical stress on the plantar fascia or foot structure, caused by walking or running. An infra-red pressure assessment may also be used to provide data to analyse increased forces through your feet. Orthotics are useful for certain symptoms of arch pain which could be prescribed to you to improve symptoms and offload areas of the feet caused by mechanical inefficiencies.